Seoul: North Korea has yet to develop a nuclear warhead small enough to fit on a missile, a senior US official said on Wednesday, contradicting a recent US military intelligence report. The North claimed its third atomic test staged in February involved a "miniaturised and lighter" warhead, prompting speculation that it had acquired the crucial technology to fit nuclear devices to a missile delivery system. The latest test - the North's most powerful to date - came only two months after it successfully launched a long-range rocket in what was widely viewed as a ballistic missile test. "I don't believe they have the capability to miniaturise the nuclear warhead, put it on top of the missile, work the launch and reentry problem, and target," said the senior US official who declined to be identified. "I don't think they have been able to put the whole piece together," he told a press briefing for foreign media in Seoul. His comments countered a recent report by the US military's Defence Intelligence Agency which suggested the North may have succeeded in miniaturising its warheads. The February test drew UN sanctions which in turn triggered a cycle of escalating military tensions on the Korean peninsula that are only now beginning to subside. At the height of the tensions, Pyongyang threatened pre-emptive nuclear strikes on the United States and South Korea. The threats prompted some hawkish politicians in Seoul to call for the South to develop its own unilateral nuclear deterrent separate from the "nuclear umbrella" provided by its US ally. The US official said the deployment of nuclear-capable US B-52s and B-2 stealth bombers in recent joint drills with South Korea were proof of US commitment to providing a complete nuclear deterrent. "I don't think South Korea needs to develop its own nuclear capability," he said, adding that such a move carried "a lot, a lot, a lot of responsibility". "And the headache it brings is more than you understand right now. 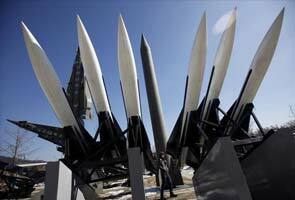 And I think that the US is able to be there to provide what we call an extended nuclear deterrence," he said.